It may have been a coincidence, but there was increased management scrutiny of trains at Fernley today. This morning, with Fernley dripping under an unusually long rain (in fact, it rained continuously almost the entire day today), I noticed a black SUV parked out in Fernley's small yard. I saw two men in yellow safety vests walking around. One of them placed large red boards ("red flags") between the rails. Presently, two intermodal trains came into town, the eastbound on the main (closest to the camera) and the westbound on the siding. From the discussion on the radio scanner, it appears that this was a Road Foreman of Engines (supervisor of locomotive crews). When the trains stop, the foreman took down the red flags, boarded the eastbound train, and both trains continued on their way. The SUV appeared at least one more time later that day and the performance (stop a train and board it) was repeated. I don't know if this had anything to do with yesterday's fatal trespasser event. The foreman may have been just conducting spot inspections. After having lunch (actually a very late breakfast) at Jake's Restaurant at the Silverado Casino in Fernley and having a very nice bit of luck on the Willy Wonka slot machine ($10 turned into $27), Lisa and I drove over to Big R in Fallon, as she was looking for several bits of hardware they were likely to have, and the Big R opening here in Fernley appears to be like a mirage in the desert: always just on the horizon. (It has been "two months away" for about two years now.) As part of our war on the Russian Thistle (tumbleweeds to most people) growing around the house, Lisa bought a weed burner. Obviously we shouldn't use it during fire weather warnings; however, with the soaking we got today (and expect to get tomorrow), next week might well be a good time to try and burn out some of these darn weeds. As we were leaving Big R, I heard a train horn. It was the Fallon Local, making its slow way out of Fallon back toward the main line on the 10 MPH Fallon Industrial Lead. We got out ahead of it and stopped to take a short video. In an odd coincidence, there were consecutively-numbered GP60 locomotives (1096 and 1097) on the point of this industrial switcher. It's about fifteen miles from here to Hazen and the connection to the UP mainline. We drove the 30 miles or so home to Fernley and Lisa made dinner. 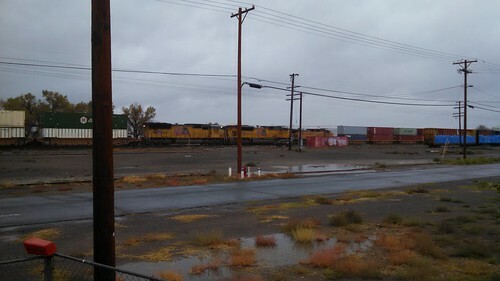 Just as I was doing the washing up, about two hours after we'd left Fallon, we heard a train on the main, and sure enough, it was the train we'd recorded in Fallon, heading home to Sparks at track speed (70 MPH through Fernley). Aside from the short trip to do hardware shopping and a walk after dinner when the rain had subsided to a light mist, we took most of today off. I had a bunch of medical-insurance paperwork on which I needed to catch up dating back to the Worldcon trip, and that took a couple of hours, but otherwise it's been a day of rest.